Adding an external USB hard drive to your computer really makes it easy to create full backups of all your programs, photos, music and other files that reside on today’s massive hard drives. And as we all know, with mass storage devices, bigger is always better. 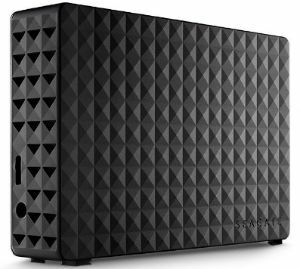 The Seagate Expansion 4TB Desktop USB 3.0 External Hard Drive will likely hold everything you can pack on to your computer’s internal hard drive, and a whole lot more. It’s super easy to install (just plug it in) and it’s lightning fast when connected to one of your computer’s USB 3.0 ports! Since the Expansion 4TB USB drive comes with it’s own power supply, it will work with any open USB port, even one found on an unpowered hub. And since it’s backwards compatible with USB 2.0, it will work just fine with your existing PC – even if it isn’t equipped with super-speed USB 3.0. This drive comes with everything you need to get it up and running in seconds, and it’s covered by a 1 year warranty from Seagate. Just take it out of the box, connect the USB cable and AC power adapter, and then watch as Windows quickly recognizes the full capacity of the drive and makes it available for use in Windows Explorer. While there are larger external hard drives on the market, I’ve found that the 4TB of storage on this drive is plenty for storing those ever-important System Image backups. In fact, I currently have over a dozen backup sets stored on mine and it’s used only a tiny fraction of the available storage space. Another thing I’ve noticed while using this drive is how cool it remains to the touch. Unlike some other external hard drives, this one doesn’t get very warm at all. That has to be a plus for the drive’s long-term durability. All of the above being said, there is one thing about this drive that could be better – its physical size. At almost 5 inches tall and over 7 inches long, this is not a small drive. It won’t take up a huge amount of your desk space, but if you have a small desk to begin with it might be something for you to consider. Bottom line: If you’re looking for a compact external hard drive that you can carry in your pocket, there are plenty of smaller drives (that don’t require an electrical outlet) available that are probably better suited for that. But if what you really need is a very reliable drive with lots of storage space for use in your home or office, this excellent drive from Seagate is a great choice in my opinion. Click here to read more about the Seagate Expansion 4TB Desktop USB 3.0 External Hard Drive on Amazon, including hundreds of overwhelmingly positive user reviews. Bonus tip #1: One of the best uses ever for large external hard drives such as this one is creating regular System Image backups of your Windows installation. These posts explain how to easily create a System Image backup on your PC.